The perfect solution for harsh conditions, TechBrite’s LED Vaportite Retro Strip is damp listed, wet listed and certified NSF/ ANSI2 Sanitation. 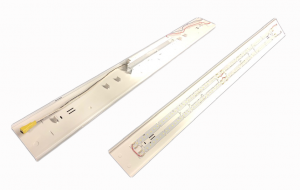 With an IP67 rating, the LED Vaportite Strip is designed to minimize the retention of liquids or debris when hosed down. TechBrite’s LED Vaportite Retro Strip meets or exceeds all applicable NSF/ ANSI sanitation requirements.